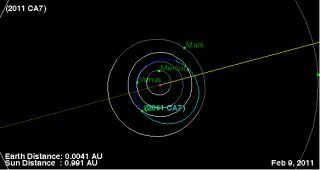 This NASA plot shows the Feb. 9, 2011 flyby of the asteroid 2011 CA7 as it passes close by Earth. The asteroid poses no threat of impacting the planet. An asteroid about the size of a car will pass close by Earth Wednesday (Feb. 9), the second space rock in five days to fly near – but pose no threat of hitting – our planet. The asteroid is called 2011 CA7 and will fly within 64,300 miles (103,480 kilometers) of Earth tomorrow, according to an alert from NASA's Asteroid Watch program. It is about 9 1/2 feet across (nearly 3 meters) and was discovered by astronomers earlier this month. The asteroid will make its closest pass by Earth at around 2:25 p.m. EST (1925 GMT), according to the small-body database overseen by NASA's Jet Propulsion Laboratory in Pasadena, Calif.
On Feb. 4, the asteroid 2011 CQ 1 sailed within 3,400 miles (5471 km) of Earth during its brief encounter. That asteroid was about 4 feet (1.3 meters) wide, less than half the size of 2011 CA7. For comparison, the distance between Earth and the moon is about 238,900 miles (384,402 km). Like Friday's asteroid flyby, 2011 CA7 poses no threat of impacting Earth. Even if it did enter Earth's atmosphere, the space rock would never survive the fiery trip to the surface. It's so small, it would likely break apart or incinerate on the way down. Scientists say asteroids the size of 2011 CA7 and 2011 CQ 1 regularly fly close by Earth, but their small size makes them hard to spot. "It's predicted that tiny space rocks pass between Earth and moon almost daily but are too small to be detected and pose very little threat," NASA's asteroid-tracking team wrote in a Twitter message Monday (Feb. 7). NASA and other dedicated astronomers routinely track asteroids and comets as part of a near-Earth observation program designed to seek out potentially hazardous objects that could pose an impact risk to Earth. Potentially hazardous asteroids are space rocks about 490 feet (nearly 150 meters) wide or larger that fly too close to Earth for comfort, NASA officials have said. The space agency's Near-Earth Object office at JPL coordinates efforts to detect, track and characterize the threats posed by asteroids and comets.